Why is 266 So Important Today, #GivingTuesday? You and I know that every life is priceless. Each and every person has a unique talent to share, love to give as well as receive, and an impact to make on the world. You and I also know there are some who think that life is disposable. Some deny the humanity of the unborn. Some don’t believe that those living with disabilities or serious illness have worthwhile lives. Many have been deceived into believing that death is an acceptable solution to human problems. 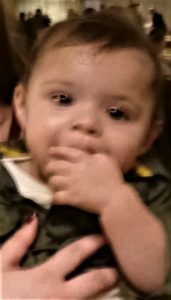 Baby Antoine was saved by a Wisconsin Right to Life Emergency Grant. All the work of Wisconsin Right to Life depends on your generous donations. 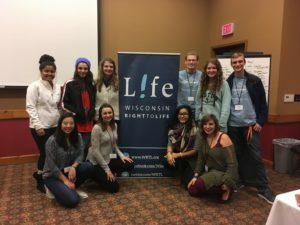 Wisconsin Right to Life works to create a society in which every person’s right to life is secure. Our vision is to touch hearts and minds so that all will cherish human life. Our goal is to Build Wisconsin for Life! Your gifts will help us teach teens and college students the truth about life as well as give them the skills and resources to share these truths with their peers. Every life deserves to be cherished. Every life is invaluable. That is why the number 266 is so amazing. It costs Wisconsin Right to Life only $266 to save one precious, priceless life! $266. That’s only $22.16 a month – less than what many of us spend on coffee each month and less than a family meal at many fast-food restaurants. Your #GivingTuesday gifts will help the Wisconsin Right to Life Education Fund save lives throughout Wisconsin with Emergency Grants. It will help us save lives by teaching teens and college students the truth about life to counter the misinformation they receive daily from abortion advocates. Every gift will help. As you think about your donations today, though, please consider a gift to Wisconsin Right to Life of $266, or only $22.16 a month, to save one, precious life. Your generosity will help Build Wisconsin for Life in 2019. It will help make the deadly practices of abortion, euthanasia, and infanticide unacceptable solutions to human problems. Your gifts to Wisconsin Right to Life will save lives — Thank you for your generosity as we Build Wisconsin for Life! The Wisconsin Right to Life Education Fund is a 501(c)3 entity and your gifts are fully tax-deductible. Your ticket for the: Why is 266 So Important Today, #GivingTuesday?